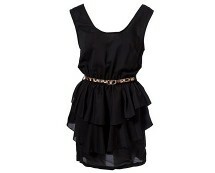 This vest dress featuring a gorgeous contrast peplum detail is a must have this season. For only £30.00 you could not ask for more, as this dress looks extremely luxurious. Cap sleeve peplum dress with pleated cross over V neck and peplum waist detail. Zip back fastening. Stretch fabric for comfort and ease. Approx length 39 inch. Colour: Cobalt. Polyester. Hand wash only.